I’m coming down with a cold (this is atrocious timing; I’ve still got some Christmas shopping and a good deal of seasonal cooking to do, and this is one of the busiest times of year at work). Mr Weasel took pity on me and has done the baking for tonight’s post. 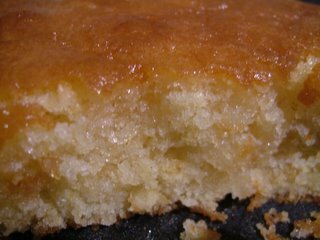 Lemon drizzle cake is a staple of church fetes, school fundraisers and coffee mornings across the country. Marco Pierre White may be driving yet another media campaign along the lines of ‘British food stinks and you’re all lazy toads‘, but he surely can’t find anything bad to say about our cakes. The lemon drizzle cake is a thing of genius, and is full of healthful vitamin C for all those of you who, like me, are brewing colds. It’s a feathery, light sponge flavoured with the natural oils from the lemon zest, and topped with a sugary, lemony, crunchy coating. Pre-heat the oven to 180c/350f, and line and grease a 7in deep round cake tin. Mr Weasel beat all the cake ingredients together until light, smooth and fluffy, turned the mixture into the tin and baked for 40 minutes. Use the patented Mr Weasel Aural Method to find out whether your cake is done; put an ear near it. (Do not burn your ear. I don’t want a McDonald’s-style lawsuit on my cakey hands.) An underdone cake will make tiny pricking noises. A done cake will be silent, which is how cakes should be. 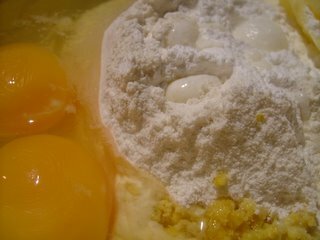 Made the sugar and lemon juice into a paste, and prick the surface of the hot cake with a fork. Spread the paste over the top, leave it in the cake tin to cool, turn out and eat. I want to be full of righteous indignation, but you can’t really challenge what he said about motorway food – even a “plebian” like me won’t touch it. I’ll never forget my rage at paying £7.99 at the Severn View Little Chef for a small, badly-cooked portion of scampi and chips, having spent the previous two weeks getting delicious 3-course lunches in Brittany for the same price. If you’re “passionate about local, seasonal produce, and fascinated by wild foods”, why is the first ingredient in the recipe “margarine” – one of the first industrial food stuffs. What’s wrong with butter? Read carefully. It’s not my recipe – this is a Mary Berry standard. Mary Berry, Queen of the Cake and Doyenne of the Traybake is a much better baker than I am; I’d recommend this particular cake to anyone. As it happens, margarine is actually more successful in this cake than butter (which I’ve also tried) – the texture works out lighter. Anyway. Nothing’s wrong with butter; I’m very fond of the stuff. Have a flick through the other recipes on this blog – you’ll find more butter, duck fat and other artery-jamming good things than you can shake a stick at. It’s important to remember that being a bit of a real-foods hippy doesn’t preclude the use of certain ingredients which do the job well. Margarine works well here, so I’m sticking with it. It *doesn’t* work well in frying, on toast or in many other baked goods, but that doesn’t mean that I’m going to be shy about using it where it does. I made this yesterday morning before whizzing off for lunch with family – took me all of 10 minutes to throw together and the reult was fab. Thank you! Absolutely delicious kept in an airtight container and eaten in about 2 or 3 days! !